Our skilled team of Fire Door Inspectors will make sure your fire doors are fully compliant with all current standards and regulations. Fire doors are a crucial part of any public, commercial or multiple-occupancy buildings protection strategy. They resist fire and smoke, protect escape routes and essentially save lives, but only if they work properly. Legislation dictates that the building owner is responsible and that Fire Doors should be checked every 6 months and moreover, you need to show evidence of this. Our Fire Door Inspection service means that we will assess the door, report our findings and where necessary, correct any issues. Roll over a service on the left to view more information. We have a skilled team of qualified Fire Door Inspectors covering all of Ireland. 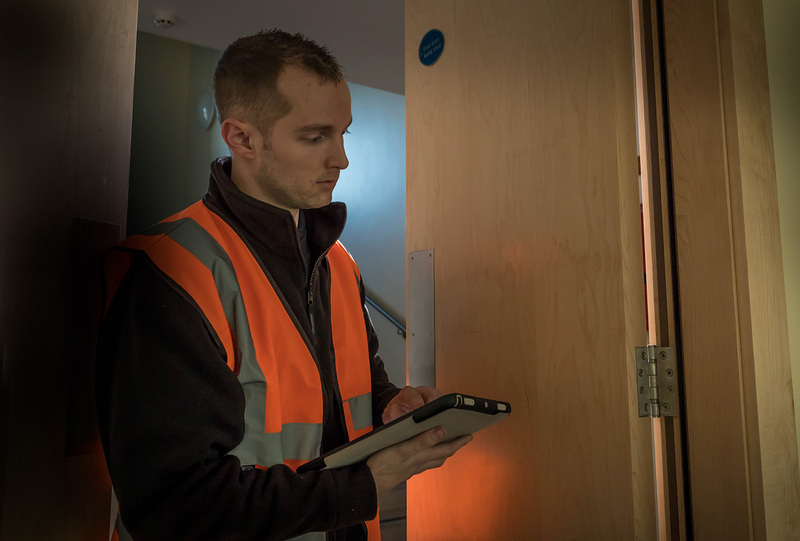 Our team will check all of your Fire Doors on-site to ensure that they are safe, compliant and effective in protecting occupants against smoke and flames in the event of a fire. We check and test all relevant components of your fire door assembly and issue a detailed report. We will identify any doors that do not meet the recommended standard and will compile a detailed report outlining any defects and faults with your fire doors. Our team can facilitate the remedial works to ensure your doors are compliant. As part of our post-inspection service, our in-house team can facilitate the remedial works to ensure your doors are compliant. Our skilled team of Fire Door Inspectors have the knowledge and expertise to ensure that the Fire Doors in your building are functioning correctly and are fully compliant with all current standards and regulations.